MINNEAPOLIS — They did it. It took a year of incredible resilience, and a tournament full of incredibly clutch plays – including one more overtime victory Monday night. It took a “united pursuit,” as Coach Tony Bennett called it, and “trembling courage” – another Bennett quote. It took all of that and more to go from last year’s first-round defeat to a national championship. 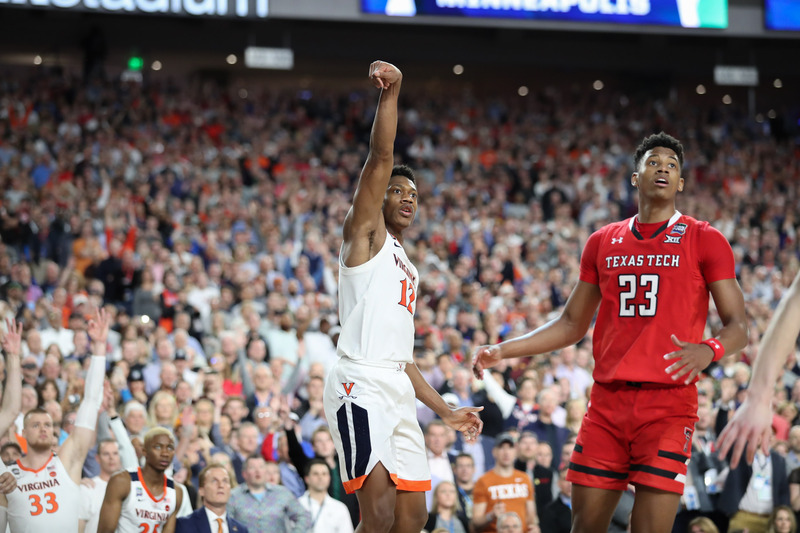 Your University of Virginia men’s basketball team is the national champion, after the Cavaliers defeated Texas Tech University, 85-77, in a gritty overtime thriller. “This is all about these young men,” Bennett said from the podium, as orange and blue confetti streamed down from the lofty ceilings of U.S. Bank Stadium and his team surrounded him, brand-new national championship caps already on. The UVA fans in the crowd, euphoric, roared at his every word. 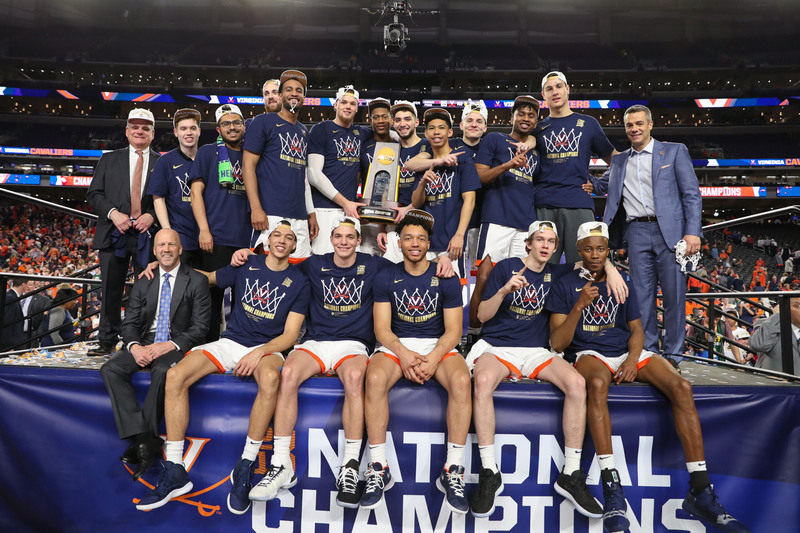 Later, in a post-game press conference with players DeAndre Hunter, Kyle Guy and Ty Jerome – all members of the NCAA Final Four All-Tournament Team – seated next to him, Bennett elaborated and discussed how a tough first-round loss to No. 16 seed University of Maryland-Baltimore County in last year’s tournament brought his players together and made them stronger. “They are really good players, but they have something different about them collectively,” he said. “After last year, they all had to deal with their own stuff, and the opinion of others, and come together, and they were just a joy to coach. According to Ty Jerome, the bond that he and his teammates share made it all possible. Guy, named the tournament’s most outstanding player, kept it simple. “We came together and said that we were going to win a national championship, and to be able to hug each other with confetti going everywhere and say we did it, it’s the greatest feeling. It’s the greatest feeling I have ever felt in basketball,” he said. The massive Cavalier crowd on hand could not have been more excited. 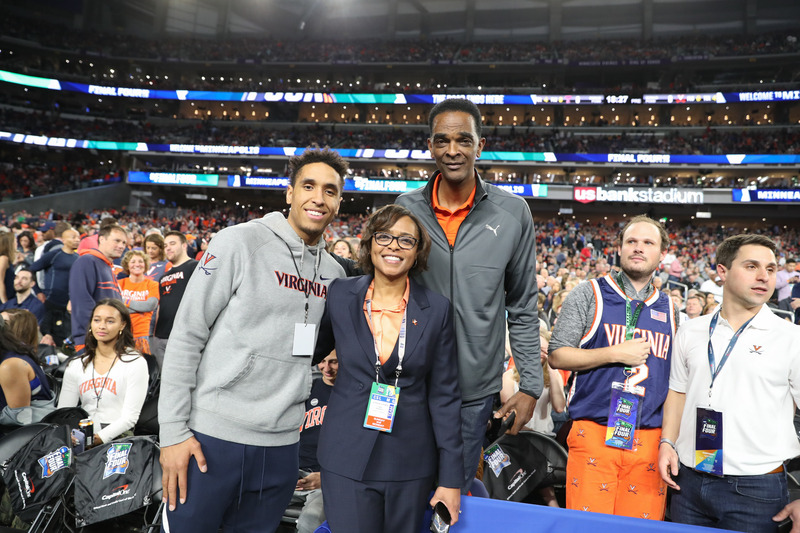 Hoos flooded Minneapolis over the weekend and on Monday, traveling from all corners of the country and around the globe to cheer on their team. They packed the stands and stayed long after the final buzzer to relish the confetti, applaud the players and Bennett as they cut down the nets, and stretch the moment just a little longer. Some of them had a very personal stake in the outcome. Watching from the first row, Priscilla Hunter was in euphoric disbelief. Her son, UVA third-year guard DeAndre Hunter, posted a game-high 27-point performance Monday night. A few seats down, Jack Salt’s sister, Sophie, also couldn’t stop smiling. Behind her, fourth-year student Bellinski Liu was enjoying a final, triumphant chance to sit in the student section. Former Hoos Malcolm Brogdon, Joe Harris, Devon Hall and Justin Anderson could hardly wait to get on the court. They bounded up as soon as they could, hugging coaches, players and each other. “I am really proud of these guys and the coaches after everything they have gone through, the ups and downs and the loss last year,” said Brogdon, currently a star for the NBA’s Milwaukee Bucks. “It’s amazing, to make it this far and seal the deal, they way that they rebounded from last year – it’s just unbelievably awesome,” Brogdon’s former teammate, Joe Harris, said. Harris is now the reigning NBA three-point champion and a guard for the NBA’s Brooklyn Nets. Another former player, Justin Anderson of the NBA’s Atlanta Hawks, was having trouble finding the right words to describe a moment generations of UVA players have been building toward. UVA’s national championship celebrations were not limited to Minneapolis. 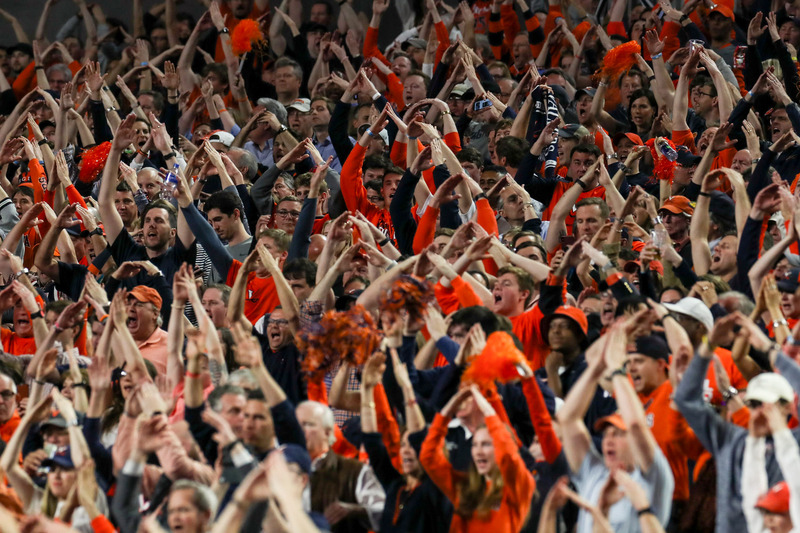 In Charlottesville, thousands gathered at John Paul Jones Arena to watch, their cheers just as loud as those half a country away. Countless more watched around the world, gathering in person in a huge variety of cities and countries, in bars and restaurants and living rooms, to cheer and help each other through one more thrilling, heart-stopping victory. And online, Hoos from around the world made themselves heard, sharing the joy of the moment near and far.